1 YRS Ningbo Chongfei Garment Accessories Co., Ltd.
8. We will send the bulk to your required address on time. 2. 100% products quality protection&on-time shipment. 3. 100% payment protection& fast production time. secondly we quote according to your requirements or our suggestions. thirdly customer confirms the samples and places deposit for formal order. material real leather, pu leather, suede, felt etc. customized fashion design sew on embossed brand name logo genuine leather jeans patches labels welcome to doylabel world! attachment magnet,butterfly clutch,plastic clutch,safety clasp tie pin,etc. e-plating gold / nickel / silver / bronze /copper etc . Leather labels Leather labels ---- are a great alternative to the traditional, commonly used woven clothing labels. 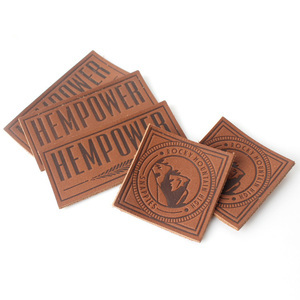 Leather labels and patches are great for durability, longlasting, and are unique. 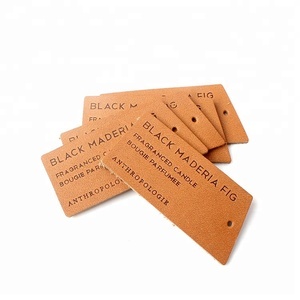 Real leather labels have a rich color that tends to vary due to the nature of the material. 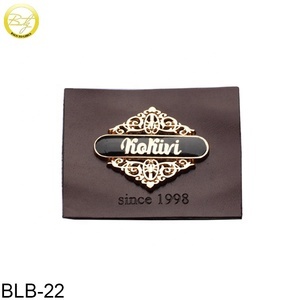 3 YRS Shishi Consen Metal Accessories Co., Ltd.
1 YRS Shenzhen Mgzse Art Co., Ltd.
why choose us leather patch pics. 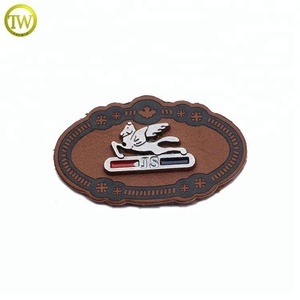 leather patch is a very popular element for make your clothes,bags,hats brand more valuable . * Custom leather label : available in many colors, you pick up the color . 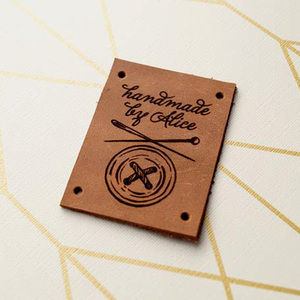 * This custom leather label is perfect for garment,bags and shoes. ,Ltd is a leader garment accessories manufacturer in China. synthetic pu leather labels, sometimes called pleather, are also a popular choice. 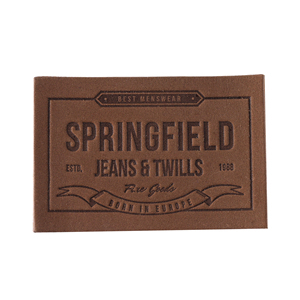 leather labels and patches are great for durability, longlasting, and are unique. etc 4.Custom packaging: Inner packing with polybags or tarrad paper,and then into cartons. Our excellent service and reputation gained the praise of customers around the world. Just tell us your ideas and we will help to carry out your ideas into perfect gift sticker. 4 YRS Guangzhou Youjia Garment Accessories Co., Ltd.
With us your money in safe your business in safe. We have specialized in this field for more than 10 years . We always provide high quality goods with factory price and efficient service . Please inform me the items,size and packages you interested in ,so we can offer you the price list you want for your reference . Q3:Could you send me some samples9 A:We can offer free samples for your evaluation,but the sample delivery charge should you pay. Q4:Could you make my own designs9 A:Yes,we can,pls show your designs to our salesman first. Tell us if you have any question so that we can make it perfect to meet your request. 2. We can design it by your ideas, descriptions and so on if you have no artwork. 3. 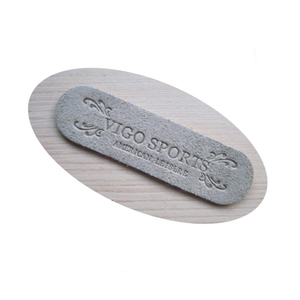 Good Quality : Our Quality Control Department will check the goods strictly. 1 YRS Dongguan Xuanhui Garments Accessories Co., Ltd.
real leather label for garments / jeans leather patch labels / custom leather label Note: the Price and time of transaction information is for reference only, depends on the order quantity and craft. etc Technics: thermal printing ,embossed ,hot Stamp, laser cut,embroidery,gloss oil ,hollowed-out,etc Applications: Widely used for garment, bags, shoes,artwares,toys, electrical equipment etc. Color: customized color Size: customized size Thickness: Customized according to your requirement(from 1cm to 3cm) metal leather label Material: PU,imitation leather, real leather, synthetic leather, wash-water paper leather. Custom woven label sample is free charge, Sample time is just three day; production lead time is 5-7 days, it depends on how many labels that you order. When you place an order, we will estimate shipping and delivery date for you based on the availability of your items and the shipping options you choose. 4.How about the sample time and the production time9 The samples time will be 3-5 days after confirm the design. 1 YRS Qingdao Huilicai International Trade Co., Ltd.
2 YRS Shenzhen Aiyecheng Industrial Co., Ltd.
7.real leather jeans labels/leather patch label on advantages: a. 2.latest printing technology and the most advanced equipment. 3.innovative design and strong responsibity. view details view details view details view details view details Small Garment Label Embossed Laser Cut Real Leather Patch Material Real leather, artificial leather, pu, micro fiber, etc Size/color Based on customer's requirments Backing Sew-on backing, iron-on backing, paper backing, adhesive backing Feature Embossed, debossed, printing, hot stamping Usage Garment, shoe, hat, handbag, suitcase and other home textile product Lead time Sample time: within 5 days Mass Production time: 7-10 days or based on your quantity Our advantages 1. best service 2. free design 3. no moq 4. high quality and low price Pictures show Packaging & Shipping Hangzhou Ouhong Garment accessories Co. , Ltd is one of the professional garment accessories supplier in Hangzhou, Zhejiang, China, enjoying high reputation at home and abroad. We can service many kinds of garment accessories, including Hang Tag Printed, woven label,hang tag, care/washing label, rubber &leather patch, embroidery patch, shopping bag, plastic tag,sticker and so on. To offer personalized service, we accept small orders like 30 0pcs. 2. &gt; You offer sample or idea, we offer graphic design, we re-make sample. 3. &gt; Mass production will be proceeded with your sample approval. undoubtedly, sinicline has abundant worldwide distribution experience due to self-support import and export right. it not only makes creative ideas into real products, but reduces cost for clients by testing and rebuilding samples in new material, technique, size and structure. Alibaba.com offers 58,878 real label products. About 2% of these are garment labels, 1% are labeling machines, and 1% are packaging labels. A wide variety of real label options are available to you, such as paper, 100% polyester, and rubber. You can also choose from embossed, printed, and embroidered. As well as from garment labels, patches. And whether real label is free samples, or paid samples. There are 58,878 real label suppliers, mainly located in Asia. The top supplying country is China (Mainland), which supply 100% of real label respectively. Real label products are most popular in North America, Western Europe, and Mid East. You can ensure product safety by selecting from certified suppliers, including 1,914 with Other, 1,408 with ISO9001, and 281 with ISO14001 certification.